Caribou2.jpgThe CaribouPlace: Litts Field. The Army's last foothold in fixed-wing aviation was the Caribou. Aussies.jpgDown Under?Don't know; Ed will have to tell us. 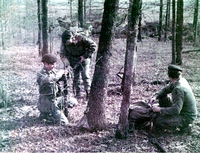 The berets and tight-fitting uniforms not usually seen in the field. 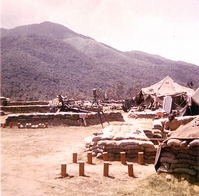 Illini.jpgBravo Battery located at LZ IlliniNote the M2 Aiming Circle and the bore calibration board. 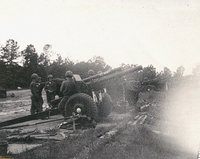 B-BtrySign.jpgMorale BuilderThe sign of "B" Battery at LZ Illini says "Ready Sir". 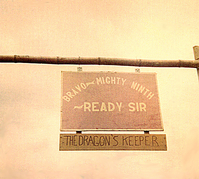 The "Dragon's Keeper" bit refers to their direct support of 1/14th Inf Regt.....the Golden Dragons, as they are known. Pleiku67.jpgPleiku, February, 1967Note the dude in starched khakis at right compared to the tall dude with a survival knife on his belt. Makes you glad to be home. Lt_Thomas,_FO.jpgThe FO Poster BoyDate: 18 Nov 66. Place: Kontum. There you have it...the classic FO in battle dress, M-16, and sleeves rolled up. Promo.jpgGetting an "Atta Boy"Date: 21 Feb 67. 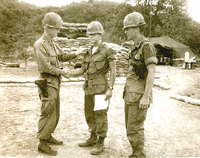 LtCol Bruce Holbrook congratulates Lt Ed Thomas and Lt Bill Farmer (later KIA) on their promotions to the grade of First Lieutenants. The 2nd Lts felt a sigh of relief. TrngSession.jpgTraining & DemoLooks like training in progress. Note the "stateside" fatigues with the white cloth name tags. Confirms that the timeframe is 1966. SpiderHole.jpgWazzit?Pic is a littel fuzzy, but it looks like a hiding spot for a VC waiting to ambush. QuickDraw.jpgYep, we were crazyFO Lt Bill Farmer and FO Lt Ed Thomas engage in a game of fast draw. 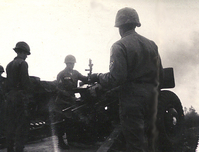 Looks like Ed got the drop on Bill, but neither man has their finger on the trigger mechanism. 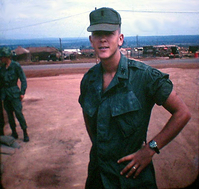 Lt Bill Farmer was later KIA as he volunteered to fill in for a absent FO. EET3a.jpgLt Edwin E. Thomas, FO for both the 35th and the 14th RegtsWe Were Soldiers...and Young...and Fit...and Good Looking...and all that. 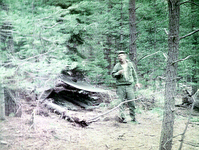 A "modern-day" photo can be found at the end of this album.